Today's National Geographic Your Shot editor's pick is this stunning image of what seems to be a man/alien hovering over the ground in a forest. 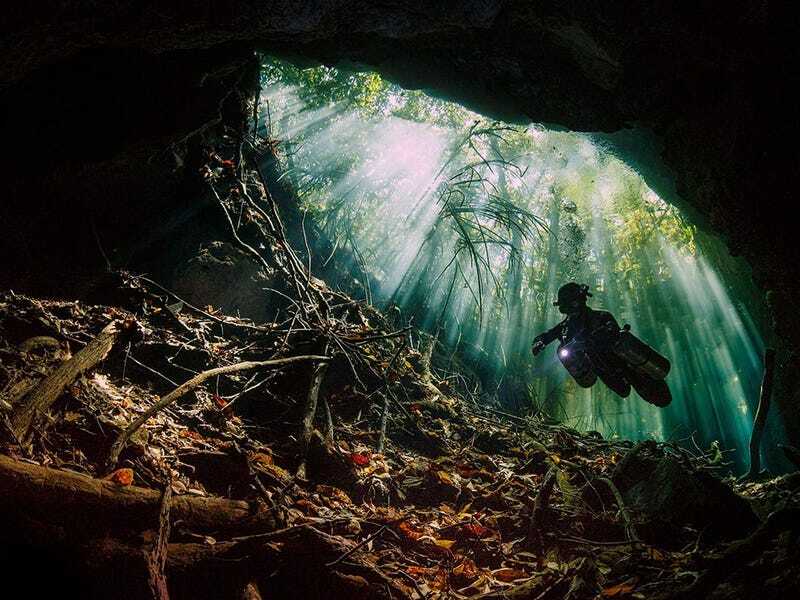 In reality, it is a surreal photo of a diver in a cenote, in the Yucatán, Mexico. The lighting is so perfect and the water so clear that you can't really tell what's going on. Timed right, diving a cenote can be a truly magical experience, hugely rewarding and unlike most other scuba adventures. I had dived many times at the Taj Mahal cenote, but today was different: Navigating my way through the tunnels to Bill's Hole provided a real treat. The intimately lit cavern layered against energetically dancing light beams was breathtaking. Indeed, a very special dive. Cenotes are natural sinkholes full of sweet water, caused by the collapse of limestone bedrock. There are many all around the Yucatán, often connected with each other with tunnels. I've dived there too and, indeed, it is a truly amazing experience.